I finally beat the 2048 game! I had to keep playing last night after I first discovered the game. And when I had also chosen to blog about it, I now had to prove I could reach the 2048 tile. 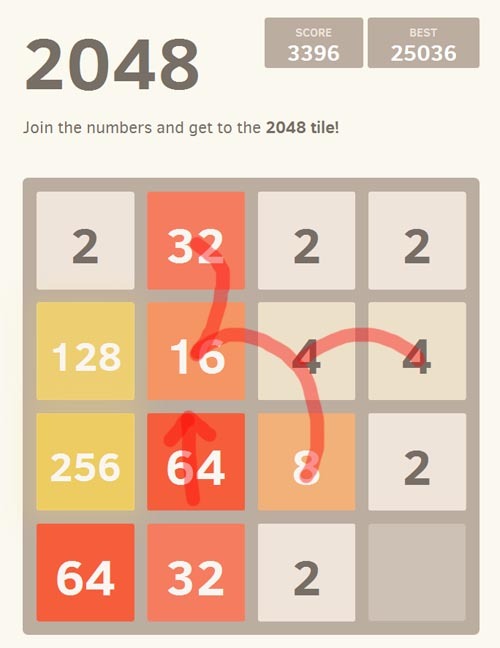 If you don’t know this browser game, here’s a short intro post I wrote about it, or just go ahead and play 2048 right now! 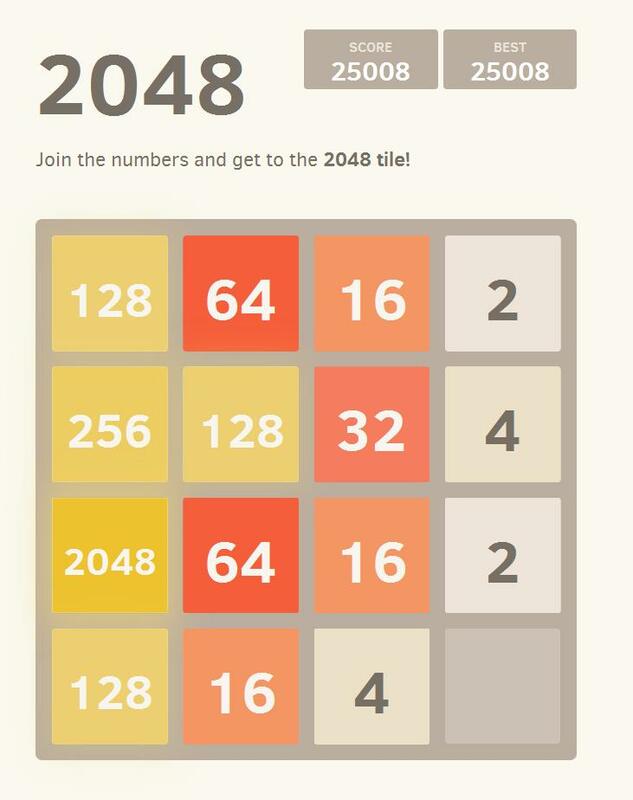 After you reach the 2048 tile, the game will allow you to keep playing. Which of course I did! I didn’t make it far enough to get a 4096 tile, but it is possible! The truth is, even though I felt addicted to the game, it didn’t bore me and I happily continued. When I lost, I didn’t get annoyed at myself or the game. Every time I beat my highscore, I just got even more excited. So all in all, if I had to feel really obsessed about a puzzle game, this was the perfect one. Now on to the strategy! I followed a few principles, and they are listed here in order of importance. Don’t push the right key (unless it’s your only viable move). 1: Choose to move your blocks in only 3 directions. I never touched the right key, and thus, my blocks never moved all the way to the right. This keeps the big numbers along the left wall, and you can then merge your blocks moving further backwards to the left. As you can see, it may not stay perfect. But don’t worry, it almost always sorts itself out. Do not fall for the temptation to press the fourth key! (Unless you are at the very end and you will win doing it). You might run into a situation where you have no choice but to press the fourth key (see picture above). But your game is not lost. It might mess it up a little, but keep going according to plan. Using the left key to merge blocks, is better than up or down (if you choose to not use the right key, as described in step 1). It keeps the bigger numbers closer to your back wall to the left, and you’ll also avoid too many smaller numbers crowding your right side area. 3: Do not panic if your board starts to fill up. It looks crowded, but look, there’s a path! It will happen, just keep your focus on where there is a merge-path. Start eyeing up the 8’s and aim to merge your 4’s and 2’s into it. Often you’ll be able to move your blocks along a whole path towards the left – merging bigger and bigger numbers. Once you’ve done that, you’ll find your free space much more open again. This is not a guaranteed way to win, it’s a strategy that will enable you to get big scores and eventually win. The computer will mostly pop 2’s, but it might also pop a 4, and they appear in a random free slot. These two random elements mean that not two games will be the same, yet you will win if you persist! I was hoping I was the only person having figured out this trick, but no. There is another strategy which is very similar: Yahoo! Finance. The author Peter Spence recommends keeping the biggest number in one corner. As you can see in the first picture, I didn’t do that, I just kept my highest tiles to the left at whatever position. Either will do I’m sure. Yet again, credit goes to Gabriele Cirulli for creating this game. Awesome! I was struggling to play 2048 before but thanks to your guide I am finally getting the hang of it. Thanks! Congrats for achieving your winning 2048 moment! I can’t express the thrill I felt when I finally got that elusive figure. I’ve spent a weekend on this. Your technique is fool-proof. I wish it would help me reach the highest possible score of 16,384. Yes, your strategy is fine. I got a little bored after I developed the same strategy so I made a new game (and introduced it on the Googel App store last Sunday). It’s called 2187 game and now you need 3 in a row before the add up. I played it a lot myself but couldn’t find the proper strategy yet. I think i loose 4 of the 5 times I play it. 8 years old boy solved the trcik for 5×5 version. link. Thank you for all these tips! I play on my talking anglena. 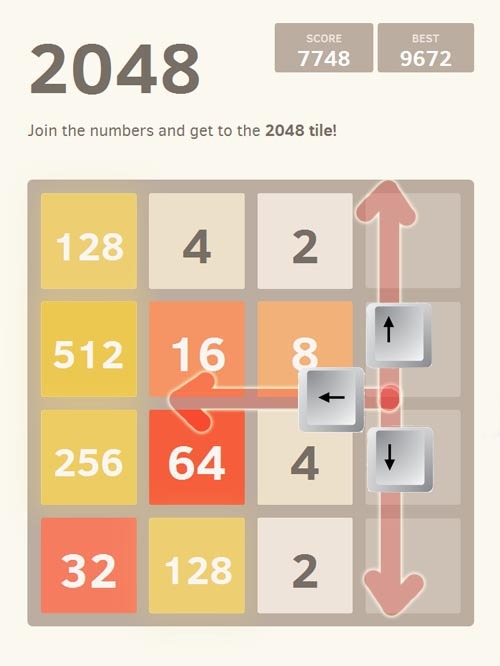 This entry was posted on March 20, 2014 by Ironyca in Browser Games and tagged 2048, Browser Game, Computer Games, Games, Guide, How To, Puzzle, Puzzle Game, Strategy.